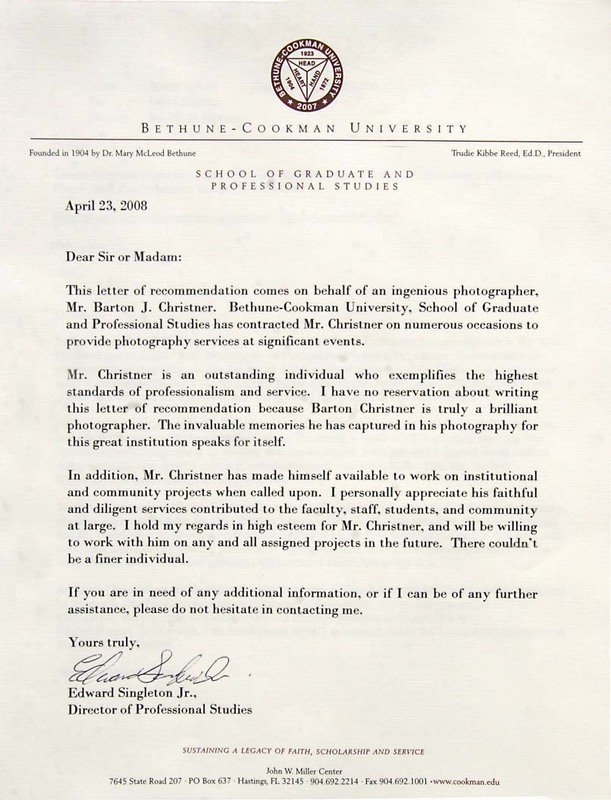 This letter of recommendation comes on behalf of an ingenious photographer, Mr. Barton J. Christner. Bethune-Cookman University, School of Graduate and Professional Studies has contracted Mr. Christner on numerous occassions to provide photography services at significant events. Mr. Christner is an outstanding individual who exemplifies the highest standards of professionalism and service. I have no reservation about writing this letter of recommendation because Barton Christner is truly a brilliant photographer. The invaluable memories he has captured in his photography for this great institution speaks for itself. In addition, Mr. Christner has made himself available to work on institutional and community projects when called upon. I personally appreciate his faithful and diligent services contributed to the faculty, staff, students, and community at large. I hold my regards in high esteem for Mr. Christner, and will be willing to work with him on any and all assigned projects in the future. There couldn't be a finer individual. If you are in need of any additional information, or if I can be of any further assistance, please do not hesitate in contacting me.